Altemir Consulting provides hands-on results-oriented lean manufacturing consulting aimed at lowering costs, increasing throughput, and meeting customers' expectations. Efficiency Enhancements. We can help drive shop floor efficiency improvements to reduce cycle times, reduce labor cost, and increase productivity. Material Cost Reduction. Bill of material and engineering design optimization as well as supplier rationalization and strategic sourcing. Production Planning, Scheduling, & Control. 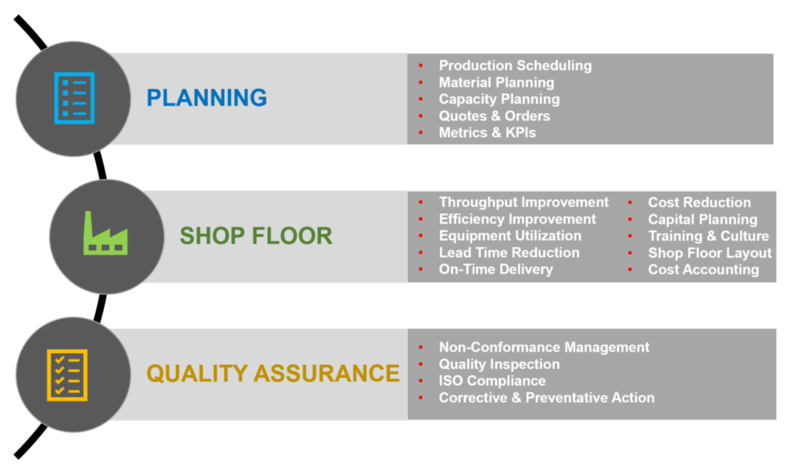 Altemir Consulting's expertise is unsurpassed in establishing effective Lean shop floor control systems to dramatically improve on-time performance. Lean MRP is our innovative production scheduling and control methodology that uses your existing ERP or APS scheduling system to establish pull-based Lean flow on the shop floor. This is a highly desirable approach, particularly for high-mix job shops. Material Availability. We can establish Lean material management processes using kanbans or JIT MRP to ensure that shop floor material shortages are eliminated. Our ERP optimization expertise can also ensure that Procurement receives the correct purchase requirements exactly when they are needed. Capacity Planning. We can establish metrics and strategies to help identify and overcome manufacturing bottlenecks and establish effective load and capacity management to ensure that customer demand is reliably met. Sales, Inventory, Operations Planning (SIOP). Altemir Consulting can implement a SIOP program that uses effective sales forecasting to drive capital planning and staffing to keep the factory and supply chain ready for what's over the horizon. Project Management. We can provide project management support whether its part of continuous improvement, a strategic initiative, or capital investment project.